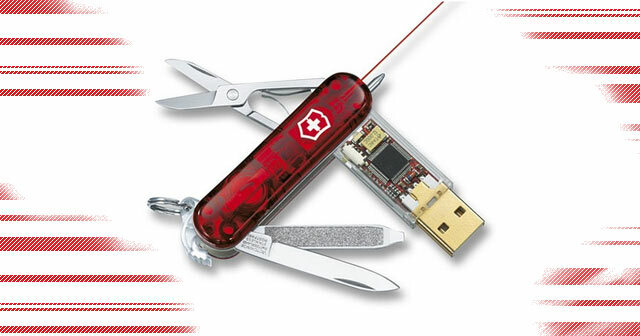 There’s something so covet-worthy about a neat and sleek Swiss Army pocket knife. Whether it has to do with its rich history, form or uses, official maker Victorinox proved at CES 2011 that the multifunctional tool has what it takes to evolve with the 21st century. It can transform anyone into a digital handyman (or woman). The company featured a few standout drives: the Victorinox Presentation Master, Victorinox Secure SSD as well as the Victorinox Slim and Slim Duo. Starting at an 8GB capacity, the Presentation Master is likely the most innovative of the bunch. It has a biometric flash drive, nail file/screwdriver, scissors, blade, laser and Bluetooth connected Power Point capabilities. The biometric feature not only reads your fingerprint, but also your body temperature and blood oxygen levels. The Victorinox Slim is encased with a colorful Swiss Army shell. It too, has the look of a pocket knife with a removable USB drive. In addition to the flash drive, the device is equipped with a pen, file, knife blade, pair of scissors and a LED light at one end. The Slim Duo boasts the same features with the exception of an extra drive for up to 128GB of digital storage at your ready. An added bonus for the Victorinox Slim is that you can maintain the Swiss Army look while still being airport-friendly, as the Slims can come without all the gingerbread (scissors, blade, etc). These USB devices are also built to endure shock and water. The Victorinox Secure SSD in 64GB, 128GB and 256GB capacities not only uses USB 2.0, but can also employ an eSATA connection. A unique feature of the drive is an electronic ink display for labeling purposes. Discovering the Victorinox drives at CES was a welcome and pleasant surprise. It’s exciting that a brand renowned for their pocket knives can create a quality product with a modern technology translation. They truly make us rethink the way we both use and view flash drives. This entry was posted in Articles, CES 2011, Flash Drive, Flash Memory Future, USB Gadgets, USB Stick, Victorinox and tagged CES 2011, Swiss Army pocket USB, Victorinox CES 2011, Victorinox new products, Victorinox Secure SSD, Victorinox Slim, Victorinox Slim Duo, Victorinox Slim Duo USB Flash Drive, Victorinox Slim USB Flash Drive, Victorinox Videos. Bookmark the permalink.